commemorates the players to be enshrined at the Professional Football Hall of Fame in Canton, Ohio, Saturday August 6th. 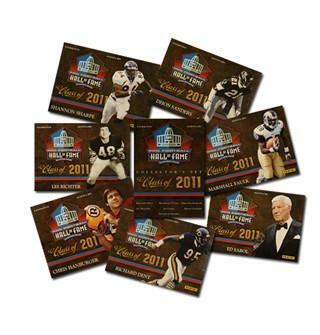 Designed and produced in partnership with Panini America, the set honors the Class of 2011- Richard Dent, Marshall Faulk, Chris Hanburger, Les Richter, Ed Sabol, Deion Sanders, and Shannon Sharpe. Eight card set with a Class of 2011 title card and seven Enshrinee cards, each honoring one of the extraordinary members of the Pro Football Hall of Fame's Class of 2011. Front of Enshrinee card features the Enshrinee's photo and name, full color Hall of Fame logo with the words Class of 2011, and the Enshrinement date (August 6, 2011). Back of player card also has the Hall of Fame logo with the words Class of 2011 above the Enshrinee's photo, and a brief paragraph detailing the spectacular highlights of the Enshrinee's career.